Welcome to Chaparral 4-H. We are a 4-H club located in Paso Robles, California. We are a club dedicated to the 4-H motto of Head, Heart, Hand and Health. Please take a few minutes to look at the many different projects that our club offers. 4-H Youth Development Program Mission Statement: "The University of California 4-H Youth Development Program engages youth in reaching their fullest potential while advancing the field of youth development". 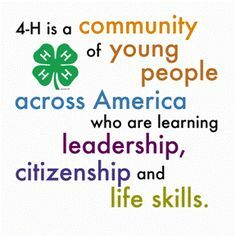 If you would like to join Chaparral 4-H or have any questions contact our Co-Community Leader, Shelly Borden, at shellyborden5@gmail.com or call her at 805-423-7975. California state 4-H Youth Development Program website.